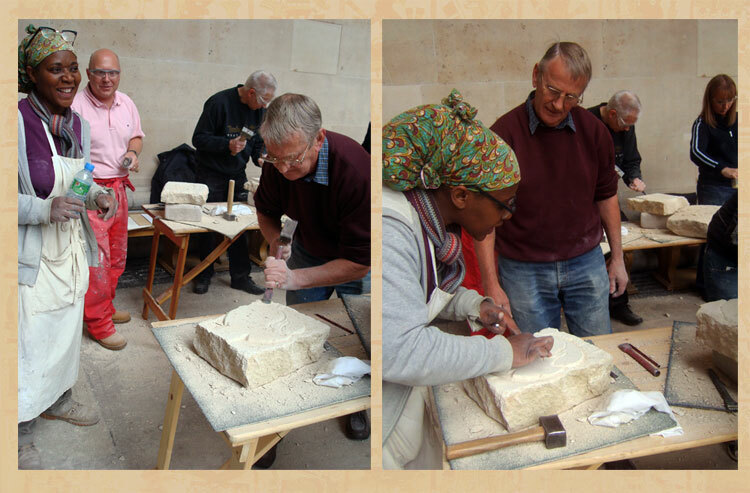 The Museum steps resounded to the energetic and creative sound of a group of highly enthusiastic adults chiselling away all day at large slabs of white stone. 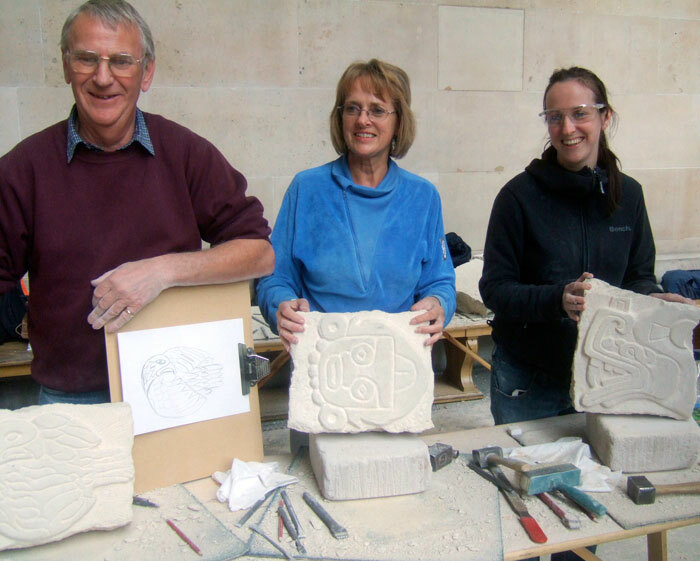 The tutor, Marcia Bennett Male, has run stone carving workshops at the BM for several years and inspired the students to draw both on their own talents and on the wealth of images in the Mexico Gallery of the Museum. First step, then, in the workshop was a visit to the Gallery to get a feel for pre-Hispanic Mexican stone carving skills. Each student made a pencil sketch of a piece that appealed to them, and then drew the same image on the bare stone outside. 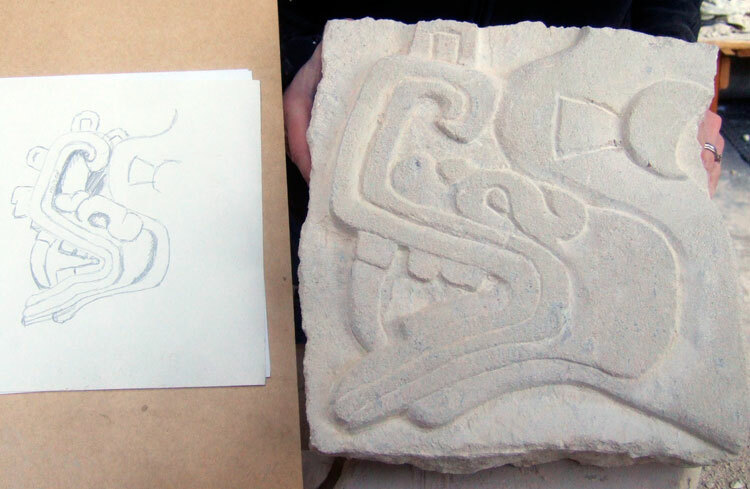 Marcia stressed that, when undertaking this sort of relief stone carving, it was vital to keep the initial image outline simple - the fine details would be added later. Basic tools included tungsten-tipped claw, flat, mallet and hammer. The flat is used to carve out the outline of the image drawn on the stone. 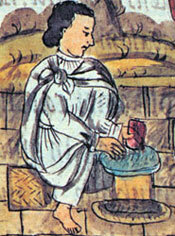 The claw is then employed to remove the waste stone. 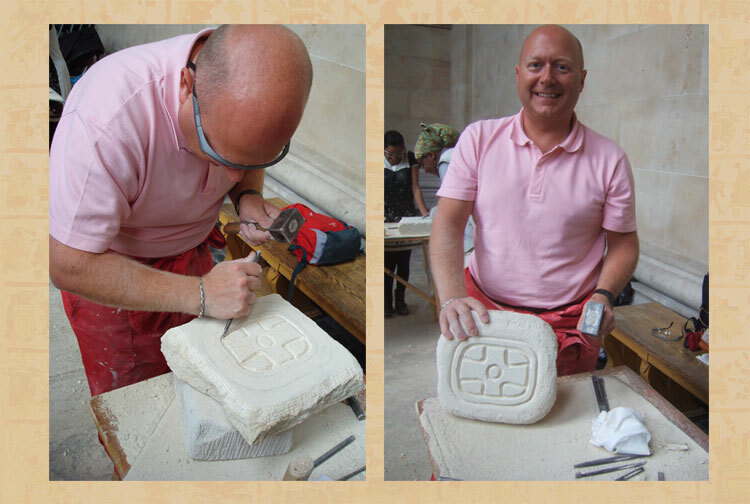 The final depth of the image in the stone has to be set. The edges are then rounded and the finer details added. 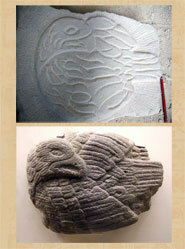 Artefacts in the Gallery that served as image models included a small Maya jade portrait head, a basalt eagle relief and the dramatic xiuhcóatl or fire serpent that first greets every visitor to the Mexico Gallery. Ancient Mexican sculptors used equally simple stone tools; interestingly, there is evidence that they made preliminary models in clay in order to plan their ideas before sculpting the final images in stone. Aztec/Mexica sculptors developed the art of interpreting strikingly realistic eagles, snakes, jaguars and many other native creatures to a very high level of skill - yet they were equally at home carving symbolic motifs. The resulting stone figures ranged from spectacular, giant monoliths to tiny figurines only a few centimetres in length.